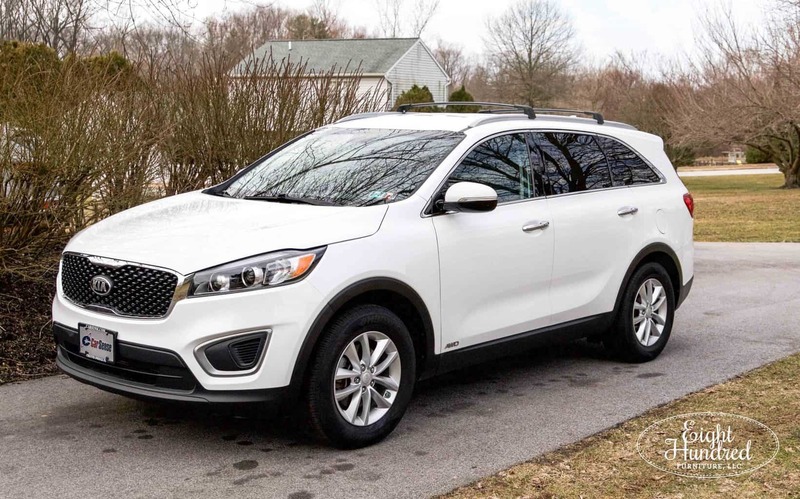 Marc and I recently bought a Kia Sorento and I’m now using it for my primary business vehicle. Now you might be wondering why I’m using that car instead of our Nissan Frontier pickup truck (aka “The Marshmallow”). 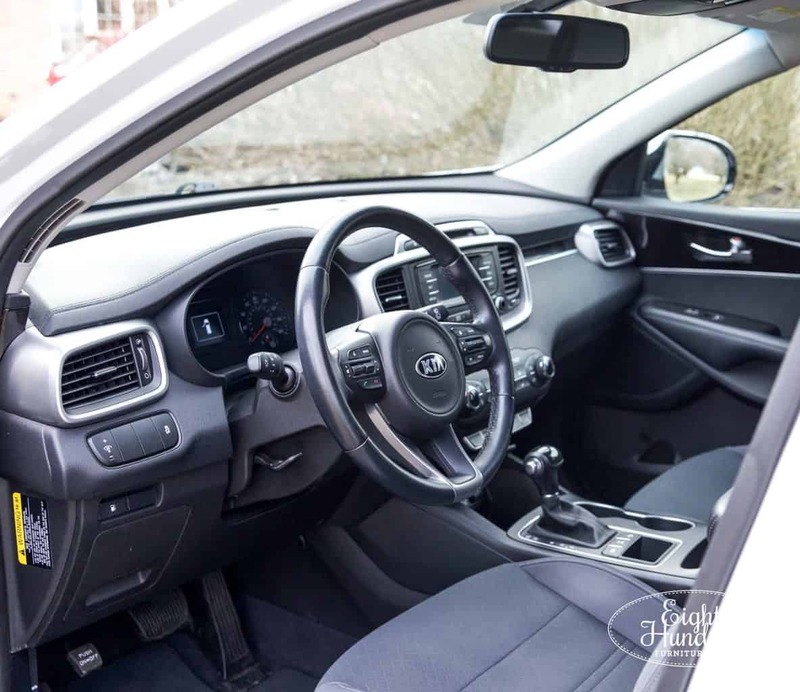 In this post, I’d like to spend some time explaining the process we went through to buy our new car, why we picked what we did and what specifications we had in mind for the new business car. Perhaps my story will help you when it comes time for you to purchase a business vehicle! So let’s begin with what got us into the car buying process in the first place. Marc had been driving a 2006 Toyota Camry for years. He plays men’s league hockey at night, so in addition to commuting to and from work, he also stored all of his hockey gear in it. I’m talking 2 sets of goalie pads, water bottles, pucks, 4 sticks and his forward gear. As I’m sure you can imagine, it smelled to high heaven in there! The time finally came where his car needed more repairs than it was worth, so we started thinking through what we wanted to do about a new car. The short version of this story is because Marc’s hockey gear stinks. That’s pretty much what this all boils down to. Marc got the truck so he can store his hockey gear in the bed. It will help keep it aired out and isolate the stench to the exterior of the truck. He’s working on getting a waterproof bed cover for it, but so far it’s working out great. Have you guys gone truck shopping? Ever? They’re crazy expensive. We could barely afford a bare-bones version of The Marshmallow. It doesn’t have power locks or power doors. But it suited our budget at the time, and it works great. But we simply don’t have the funds to buy another truck, especially one that is a 4 seater. 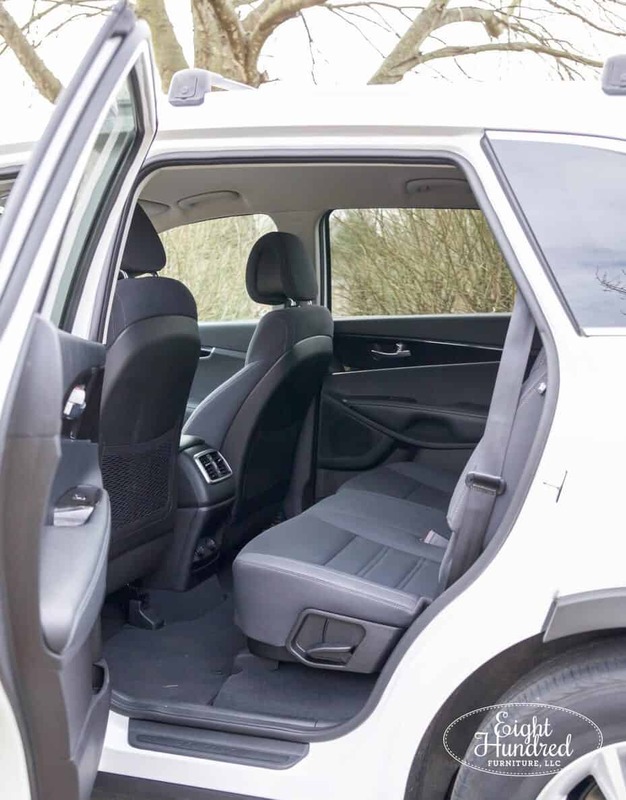 That’s another reason – we wanted a vehicle that could seat 4 people instead of 2. We live the closest to Marc’s parents out of all his siblings, and we often pick Mom and Dad Baker up from places. It makes things easier if we have a car that can fit more than just 2 people in it. This is the question I’m getting asked the most often, and it’s a really good one! The answers are the same as I listed above. Mini vans are really pricey. They come with all kinds of bells and whistles like TV’s and doors that close on their own. They’re meant for families with kids. We didn’t want to pay for features we’d never use, so we felt that was a waste of money. But don’t get me wrong – vans can hold A LOT of stuff! Sure, we could have purchased an older van, but would it come with stow-and-go seating? Could I easily convert it into a 4 seater vehicle again for Mom and Dad Baker? How many miles does it have on it? How long would it last until it died and we’d need to buy a new vehicle again? We also didn’t get a cargo van because they’re 2 seater vehicles. Plus they’re pricey as well. 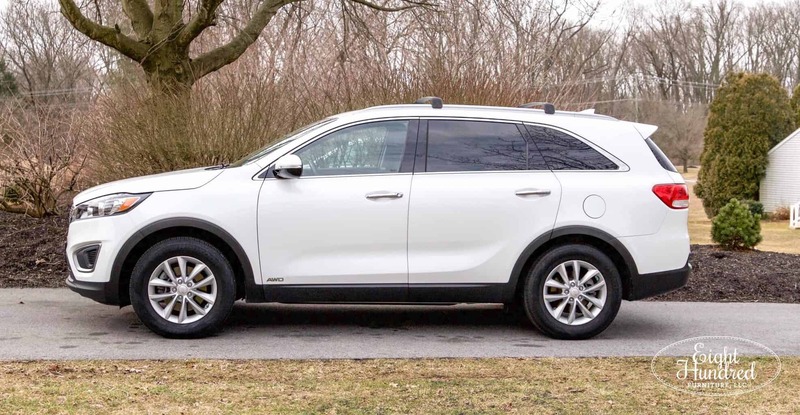 So now that I’ve explained the process a little bit, let me share why we settled on the Kia Sorento. When we were roaming the car lot, we picked a few vehicles that looked like they had a lot of room in the back. 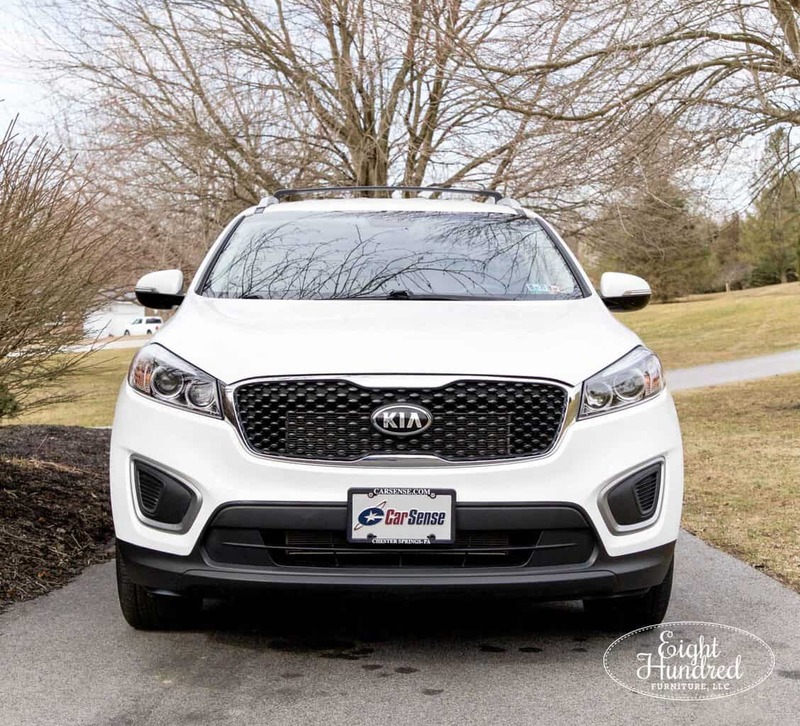 As we got in and measured each one, the Kia Sorento was the only vehicle on our list (aside from an overpriced mini van) that had the dimensions we were looking for! 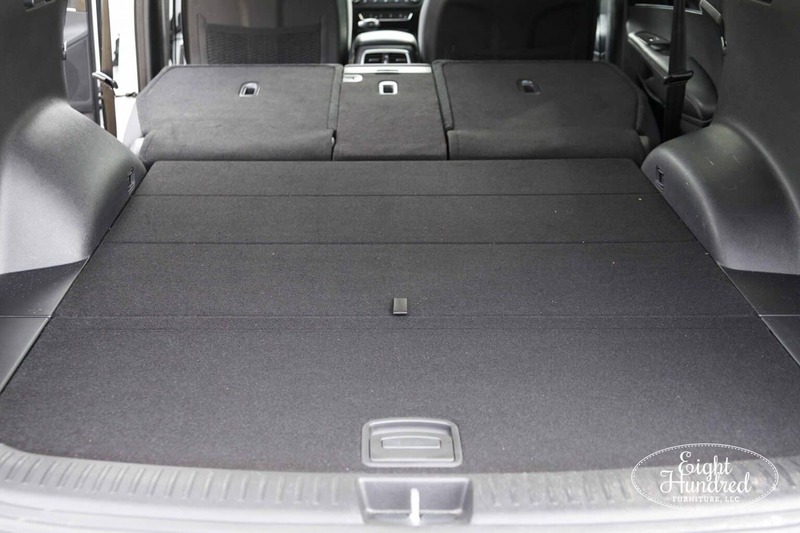 Do you know that this puppy has the same footprint of space as the truck bed? We even measured one of my buffets that I have for sale and it would totally fit in here. Even the clearance from top to bottom on the back opening is great! 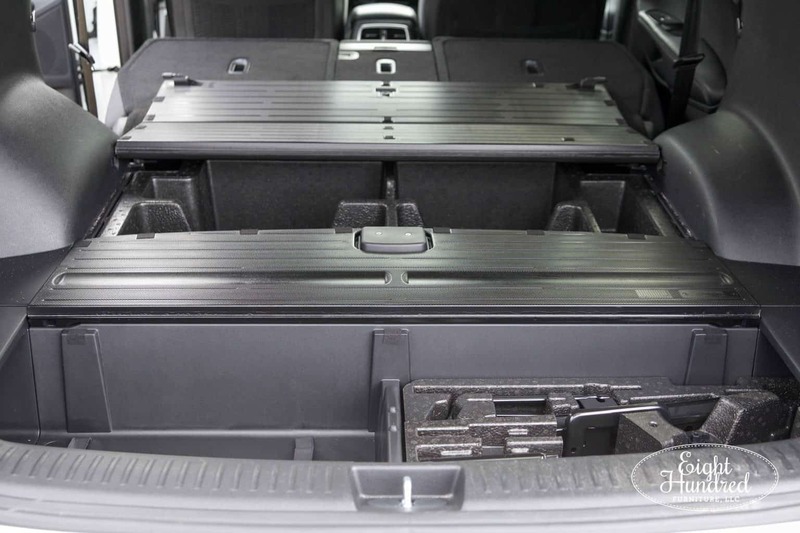 There is extra storage underneath the floor as well. This is where we hid all of my blankets, bungee cords and other things I use when I’m picking up furniture. 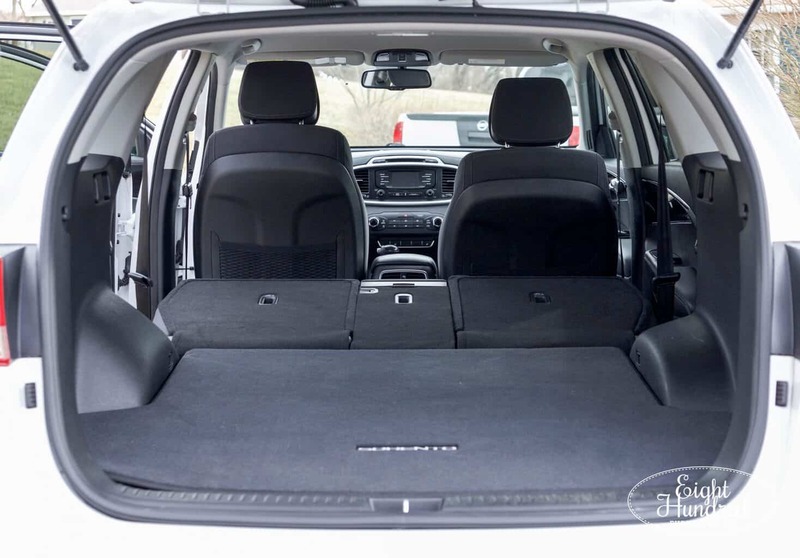 There’s actually 6 feet and 7 inches worth of space from front to back. That’s more than enough room for an average piece of furniture! The side-to-side clearance in between the wheel wells is the same as the truck. 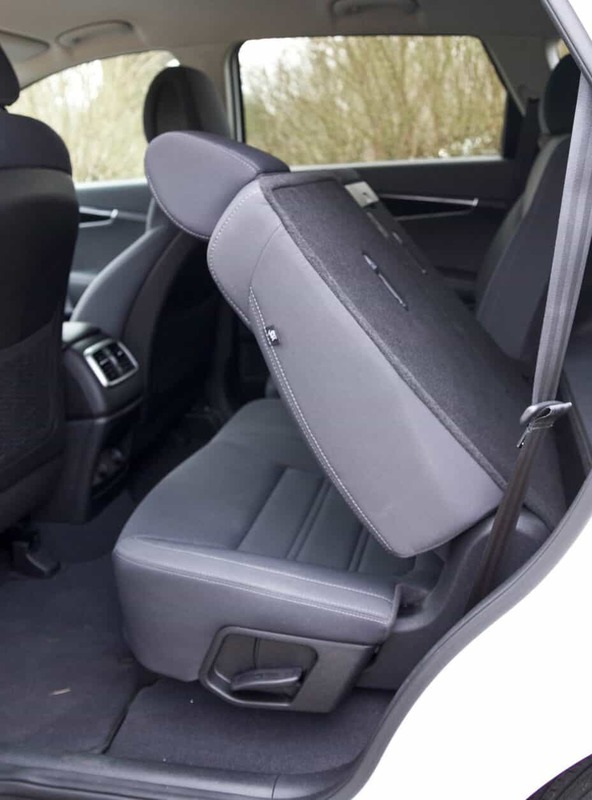 It’s easy to convert the back seat as well. All it takes is a tug on that handle towards the bottom of the seat, and the back comes down to lay flat. 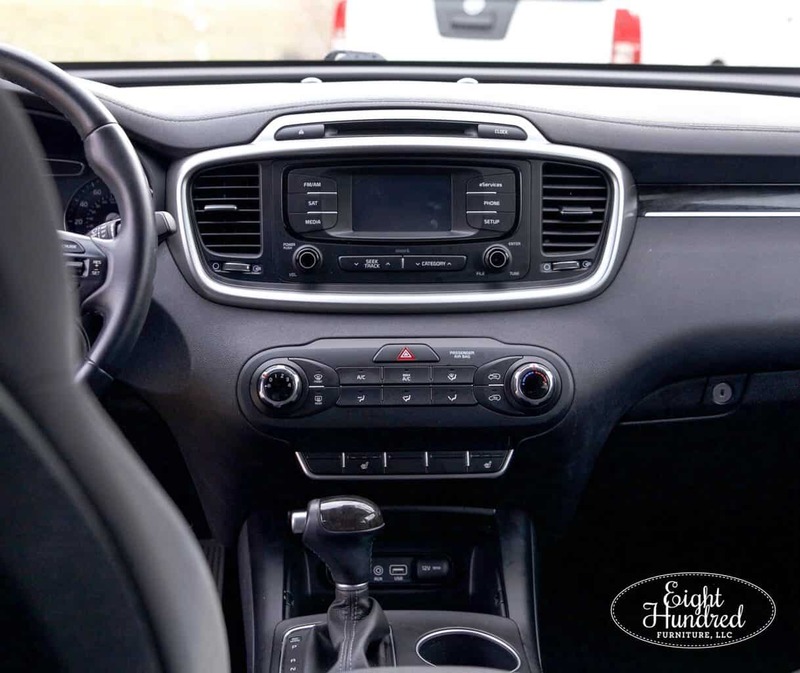 Another big reason why we picked the Kia Sorento was because of the simple dashboard. I can’t stand a lot of bells and whistles inside of cars today. There are way too many options to distract me while I’m driving. I personally feel very unsafe when I can’t find things quickly and easily. It has a luxury feel without being over-the-top. I called it “simple luxury” when we were in the car lot. The car itself handles very nicely. The pedals aren’t overly sensitive and the steering feels natural. I instantly felt right when I sat in it for a test drive. It felt like I had always been driving it! I also love the fact that it’s white. Marc nicknamed it “Marshmallow 2.0”, which I love and am keeping. I won’t share how much we paid for it, but I will say that it was incredibly reasonable given the fact that it’s a 2016 model and has 36,000 miles on it. I still can’t believe it was in our price range! 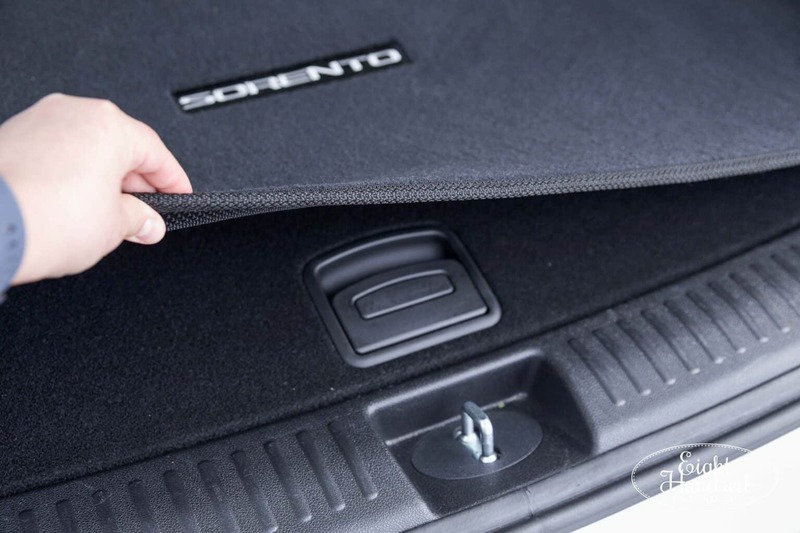 This model also has incredible safety ratings, so we felt good knowing we were purchasing a tank on wheels. 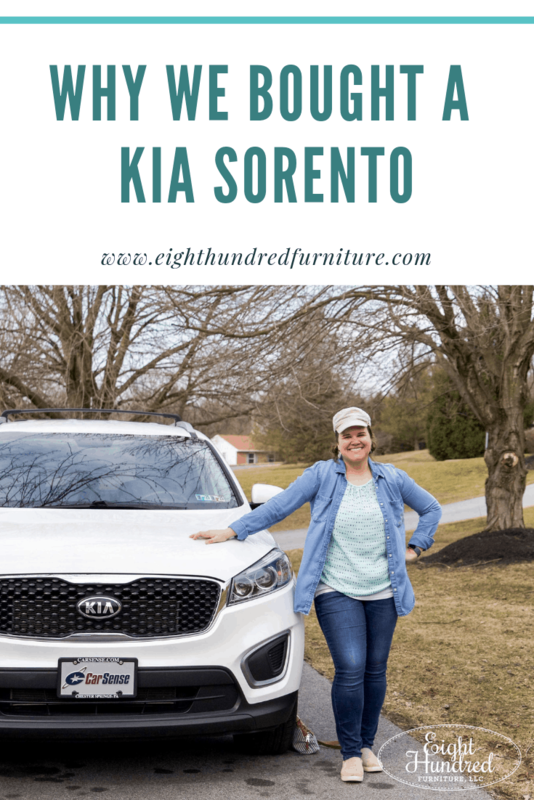 I hope this post helps you understand the car buying process we went through and why we settled on the Kia Sorento. In a nutshell, it fit our needs and our budget. Perhaps this post will help you when it’s time for you to purchase a business vehicle of your own! This looks like the perfect vehicle for you my friend!! Blessings to you for many years of moving furniture with it!! Congrats on your new car, Jenn… and your new blog! LOVE IT!!! Well worth the time and… well, you know! 😉 Love being able to comment and pin, and it loads so fast!